We believe God hears and answers prayer. 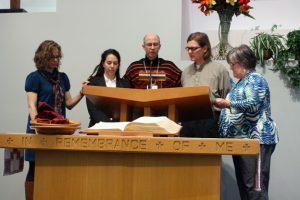 Since Mennonites consider Jesus our model for life, his instructions on prayer are the model for us. In Matthew 6, we find Jesus teaching us to pray with mindfulness of those who have offended us or are in debt to us — recognizing our need to forgive them just as God forgives us. This is consistent with Jesus’ broad theme of loving our enemies and caring for those we are least likely to love, found throughout the Gospel narratives. As Anabaptists, we see this emphasis as central to following Jesus. Secondly, the “Lord’s Prayer” — Jesus’ model prayer — uses the plural terms “our,” “we” and “us”. While we do value individual, private prayer (also modeled by Jesus), there is a special emphasis in our tradition on the understanding that ultimately we come to God in the company of others, not merely as individuals. That’s why we include time every Sunday for sharing concerns, struggles and joys. We value praying together for each other, accompanied by taking meaningful, real-world action to meet each other’s needs in practical ways. Mutual aid and service “to the least of these” — as well as corporate efforts to advance God’s reign by means of working together to promote peace and justice — are important aspects of prayer for us, too. Prayer is a way of aligning ourselves with God’s purposes for the world, and is meaningless if we’re not also willing to work to advance those purposes. We pray together on Sunday mornings, and during the week in small groups and individually, for the concerns of our church and world. Our pastors and Caring Team also pray about requests brought forward confidentially. Request prayer from a pastor. PS: We often pray the Lord’s Prayer together, as do millions of Christians around the world. Here’s a quick, fun video on this familiar yet not always understood prayer.